Introduced in 2000, the Tacuma was Daewoo's answer to the Scenic, Picasso and Zafira, undercutting all these popular rivals in price while still managing to be a stylish and attractive package for anyone in the market for a compact MPV. The vehicle received a face life in 2004. New Daewoo Tacuma cars for sale came with three years or 60,000 miles worth of free servicing. This means that even higher mileage models are likely to have been serviced on a regular basis and should therefore be in good working order. The used Daewoo Tacuma is also covered by a six year bodywork warranty so the panels are likely to be sound. With an average of 227 g/km of CO2, the Tacuma costs more in road tax than its rivals and manages only 35 mpg, so day to day running costs are going to be a little above average for this class of vehicle. 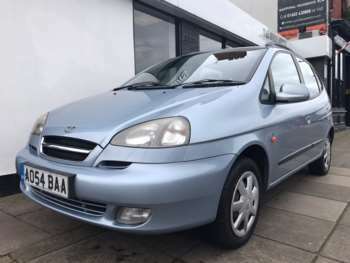 Prices start at around £1,000 for an original 2000 used Daewoo Tacuma base model but expect to pay considerably more for a later, low mileage version with upgraded equipment. Owners who have failed to take advantage of the free servicing offer are more likely to have abused their vehicles, so any cars that do not have a full service history for the first three years or 60,000 miles should be given a wide berth. If you plan to make the most of the load space, beware of the entry level version as these do not come with the removable seats fitted to the higher spec models. Several thousand cars were recalled in 2002 to fix a problem that caused cracks to form in the brake pipes, so ensure this work has been carried out if buying a car from this era. Daewoo ceased trading in 2005 but many of its models were subsequently re-badged by Chevrolet so replacement parts remain widely available. Reliability surveys suggest the second hand Tacuma and Daewoo vehicles in general are slightly more reliable than average, reducing your chance of experiencing any problems. The approved used Daewoo Tacuma for sale has a high driving position which provides a clear and commanding view of the road ahead, but it's important to remember that, with all such vehicles, the higher centre of gravity means the car may not always respond in the same way as a more conventional saloon. The 2.0 litre engine offers the best performance but suffers on the economy stakes as a result. The 1.6 version offers a better balance. In a crowded market, every manufacturer with a mini-MPV to offer tried to find a way to appeal to potential buyers. In the case of the used Daewoo Tacuma for sale, that appeal was almost entirely based on the value for money the car represented. The low original sale price means that, even though values have held up relatively well, good second hand models are often available for a song. No one is going to turn green with envy if you park a Tacuma on your drive, but if you're in the market for a reliable, low-cost mini MPV, the Tacuma is hard to beat.